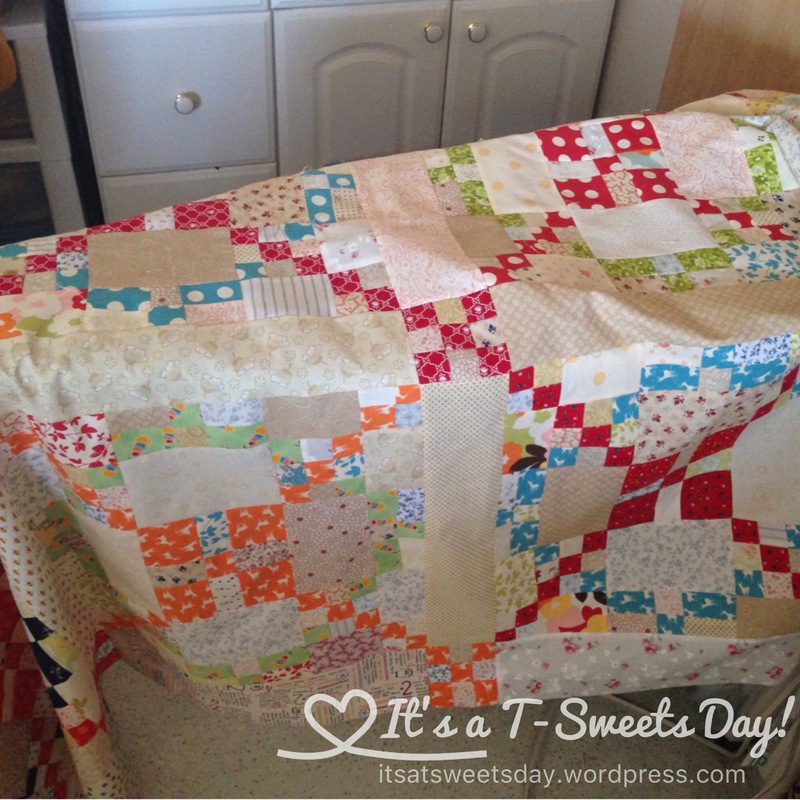 Hugs and Kisses- APQ Quilt Along 2015 – It's a T-Sweets day! Published on September 12, 2016 September 13, 2016 by Tracy @ It's a T-Sweets Day! Good morning:)! 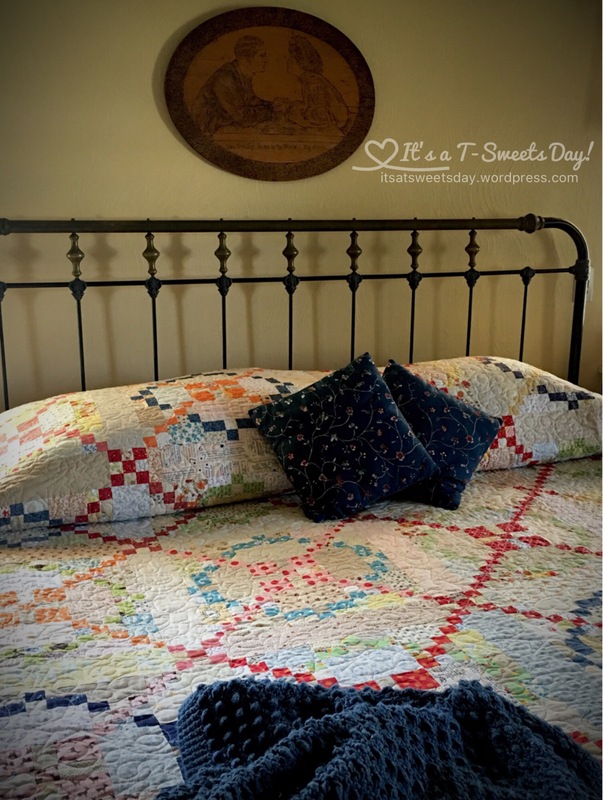 It is another Memorable Monday and today I would like to share my American Patchwork Quilting Magazine – Tone it Down quilt. But I re-named it Hugs and Kisses. Last year American Patchwork Quilting magazine hosted this fantastic quilt along that my friend and I just had to join:) The colors are just my favorites. And once again, I doubled everything so that I could get a king sized quilt for my bed. I LOVE IT! 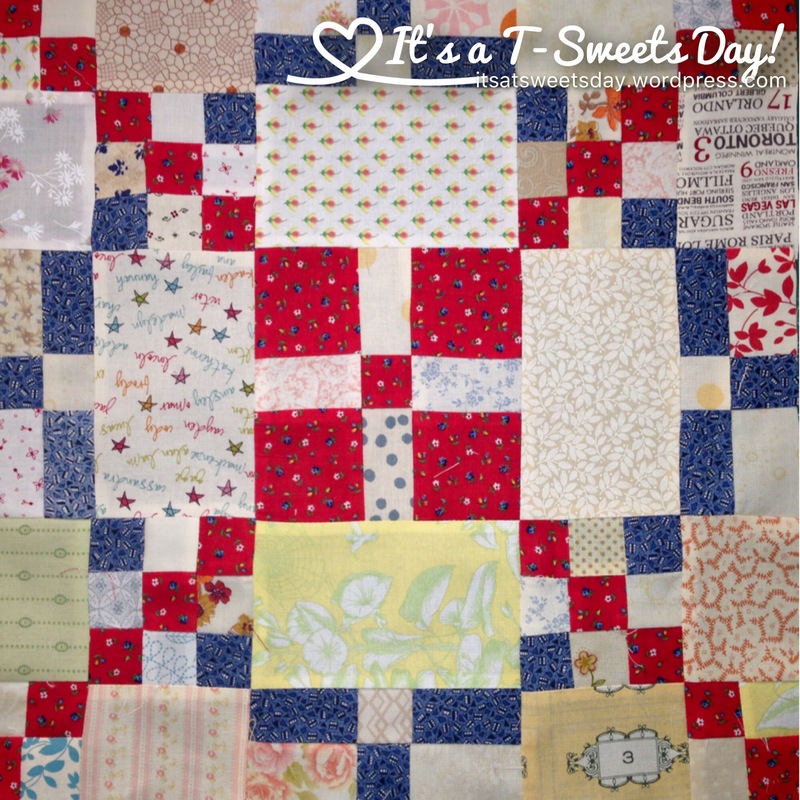 I cut hundreds and hundreds of tiny little squares and rectangles from my scraps. And sewed and sewed. I wish I would have taken a picture of each square’s little zippie bag filled with the scrap pieces for that block. I would just take one block at a time and slowly but surely, this huge masterpiece was sewn and pressed. I loved laying it out and seeing how beautiful it looked with the x’s creating the pattern over the low volume prints. I had the hardest time choosing a binding for this quilt. I decided to just use scrappy left overs here as well:). I love how they shine next to the red backing. Here it is embraced by a piece of art from my SWEET grandma above and a crocheted afghan from my great-grandma below. I feel so loved with hugs and kisses all around! Previous A Car Quilt Set for the Birthday Boy! Oh, the hugs and kisses name, surrounded by your loved ones crafty-ness, IS the PERFECT name! Love how this turned out! Thank you! I think so too:)! Beautiful, it was really the extra work to make it King sized. 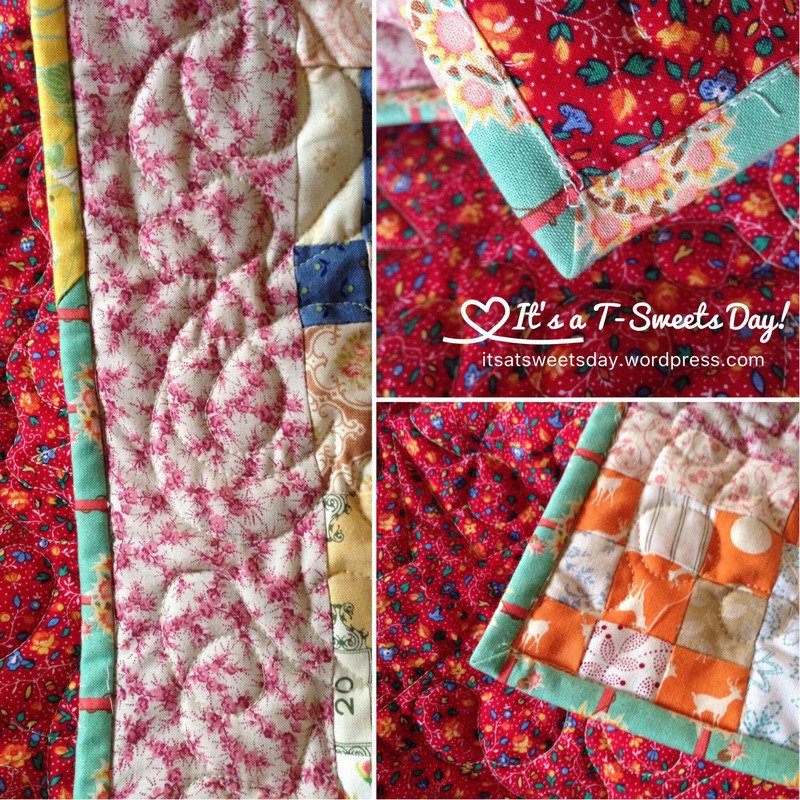 Love……..love…..love your scrap quilt! Scrap quilts are my favorite. Why use 2-3 fabrics when you can use 30? 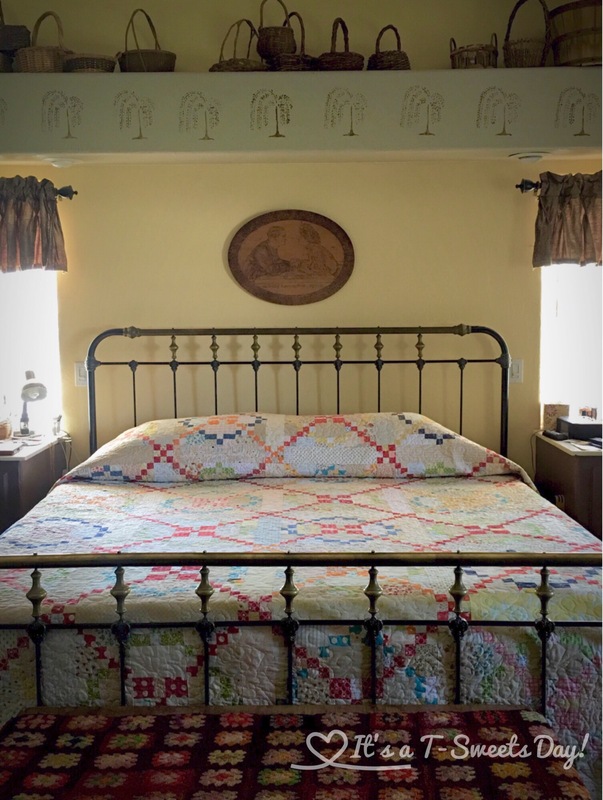 Not all scrap quilts are successful but yours is and has personality and charm. Well done! 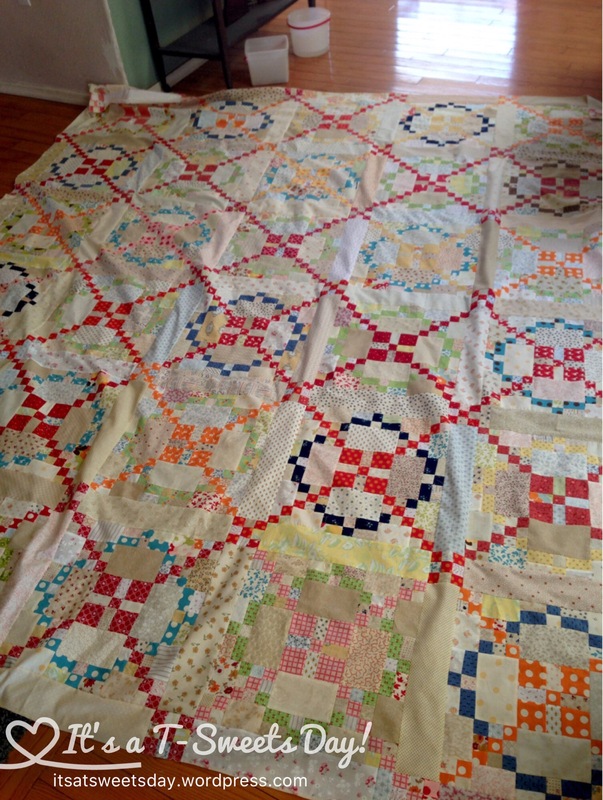 Beautiful scrap quilt. Love it!